I generally want everyone to get along and people to be happy. I don't cause much of a fuss, really. Even when things go wrong. 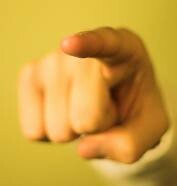 I try to roll with it and figure out what to do next to fix it instead of pointing the finger for blame. Because pointing makes people feel bad. And I don't like people to feel bad. But how often can "things" happen before you start to get frustrated and start to fight back? Before you start pointing fingers and naming names? MasterCraftsman - I hadn't read about these guys before I had them quote on refinishing some furniture for me. Tired and stressed, I had them take it away to start on the project. That night, I woke up in the middle of the night, convinced that it was the wrong decision. I changed my mind -- I didn't have the money to do what they were going to do. Then I looked them up and realized I had to stop the project. I called. They said OK, they'd get me the furniture back. THREE MONTHS LATER I'M STILL WAITING. After numerous phone calls and voice mails and complaints. Three months. Are they holding my furniture ransom? Do I start calling the police? FutureShop - I bought my fridge on sale way back. Was it November? Anyway, their first attempted delivery, my contractor decided not to be there, though he SAID he would. I told him to call to arrange for the next delivery. He didn't. Fine. So I arranged for the next delivery. They didn't show up. No call, nothing. Just no show. I call them the next day and they weren't at all apologetic, but set up another delivery time for me. I asked for the next available 5-8pm delivery time. They gave me a date. Then I get a call at 1pm on that date saying that there was no one there to receive the delivery. First, where was my contractor? Second, why were they delivering THEN? They'd scheduled the wrong time. So I rescheduled delivery, got the fridge in and I verified the working order of the fridge before the guys left. Then I saw them: gouges in my floor from the fridge. I call immediately. They say they send an email to the delivery company and I'll hear back in two days. Nothing. I finally call and get another email sent. I wait. Nothing. It's now a MONTH after delivery. After another promised status phone call completely missed, I called this a.m. and Frank is bringing this up the chain of command and calling me Tuesday to report. Rogers took a MONTH to figure out how to give me internet access. A month and two home visits, four hour-long phone calls and several missed deliverables later, I do have internet access. But NO break on cost at all. No apologies, no perks, nothing at all. First chance I get, I will leave them after being a fantastic loyal customer. I hate them now. Congratulations. Should I talk about my house renovations and how a three-week project turned into a four-MONTH project? I've mentioned a few things already, but have I mentioned that my washing machine has done leak damage to my basement floor? And that, since not being able to figure out the leak problem, my contractor hasn't been back in my house to do anything whatsoever? I have an HVAC duct that just came undone, fell off, and is just sitting there loose. I have unfinished all sorts of things.I have shoddily-done things. I wonder how these things happen. Am I too nice? By focussing on solutions and trying NOT to get mad, do people think that they can just do whatever to me? Forget about me, ignore me? I think it's fair to point the finger at them and tell them that they've disappointed me. I do my best to stay on top of things even though I have stresses and pressures in all corners. I almost cried last weekend, frustrated. I just want someone to help me: someone to do something without me watching and making sure they're actually doing it. Someone to follow up with me, tell me what's going on if there's nothing else they can do. Someone to take care of a task, even a small one, so I don't have to cram yet another thing into my skull or add it to my ridiculous bulging list. Sometimes life gets overwhelming and I want to handle it, knowing that it could be worse and sometimes it doesn't work out. Sometimes I need to shut down. And now I need to shut up, stop feeling sorry for myself and just focus on a task and just get 'er done. 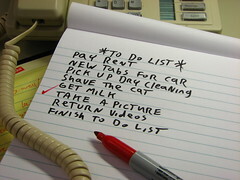 Right now, I just need something to strike off my list. Finish up flooring in back room while it's still light out, before boyfriend comes over. Clean main floor and make it livable with furniture.